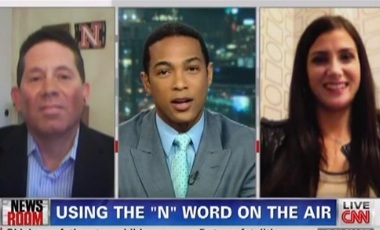 On CNN Newsroom Sunday night, Noel Sheppard, editor of conservative media watchdog Newsbusters, defended his criticism of the network’s failure to censor the n-word by telling anchor Don Lemon that “the nation is on the precipice of conceivably a very, very serious racial tension, or maybe even, heck, maybe even a race war” over the killing of Trayvon Martin and the shooting spree in Tulsa that left three black people dead and wounded two others. Breitbart.com’s Dana Loesch was also on hand to remind Lemon and his audience about what’s really important: that someone called Sarah Palin a “C U Next Tuesday” during a stand-up comedy routine. It was a compelling, if insane, 10 minutes or so of television, but there’s really only one section that we need to unpack to truly understand what’s at play with a certain corner of the conservative web. “I saw Michael Eric Tyson,” Sheppard began, as Lemon cut in to correct him. “Dyson,” Lemon said, referring to Georgetown University Professor Michael Eric Dyson. There is a segment of the conservative media that has been eager to exploit white panic in the Trayvon Martin case (and another segment that silently watches), but watching Lemon’s interview with Noel Sheppard was the first time I’ve gotten the sense that some of them are in the grip of it. Learning to tell black people apart, and actually listening to what they have to say, are a couple of steps they could take toward escaping that grip. It also wouldn’t hurt if conservatives who know better would speak up.